The Bump eRaiser range has been designed to help prevent and eliminate ingrown hairs, redness and bumps for smooth and healthy looking skin following hair removal. The Bump eRaiser product range contains an advanced combination of ingredients for a complete, effective solution. 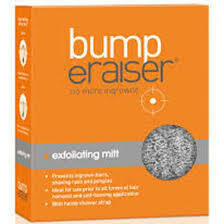 Thanks to Bump eRaiser, there is no need to suffer any longer. Be free of ingrown hairs and other problems associated with hair removal forever!